Riyadh, Saudi Arabia: Hundreds of women thronged a sports stadium for the first time to mark Saudi Arabia's national day yesterday, celebrated across the conservative kingdom with a raucous display of concerts, folk dance and fireworks. 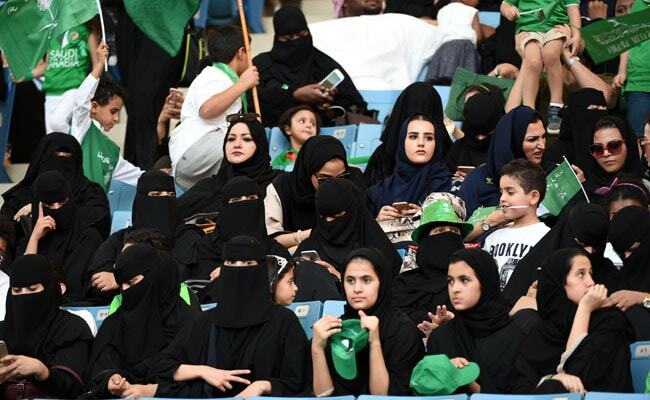 Women were allowed to enter the stadium, a previously male-only venue used mostly for football matches, with their families and seated separately from single men to watch a musical show and a play on Saudihistory. "We hope in the future that there will be no restrictions on our entrance to the stadium," Um Abdulrahman, awoman from the northwestern city of Tabuk, told AFP. The national day celebration coincides with a crucial time for Saudi Arabia, which is in a battle for regional influence with arch-rival Iran, bogged down in a controversial military intervention inneighbouring Yemen and at loggerheads with fellow US Gulf ally Qatar. "On this great occasion, we feel that the kingdom has become an important state with a pioneering role at the regional and international levels," Prince Mohammed said in a speech earlier cited by the official SaudiPress Agency. Saudi chefs in the Red Sea city of Jeddah broke the Guinness world record for baking the biggest marble cake -- with green icing -- to mark national day, the government said.